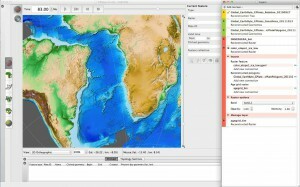 GPlates is developed by an international team of scientists and professional software developers at the EarthByte Project (part of AuScope) at the University of Sydney, the Division of Geological and Planetary Sciences (GPS) at CalTech, the Geodynamics team at the Geological Survey of Norway (NGU) and the Centre for Earth Evolution and Dynamics (CEED) at the University of Oslo. 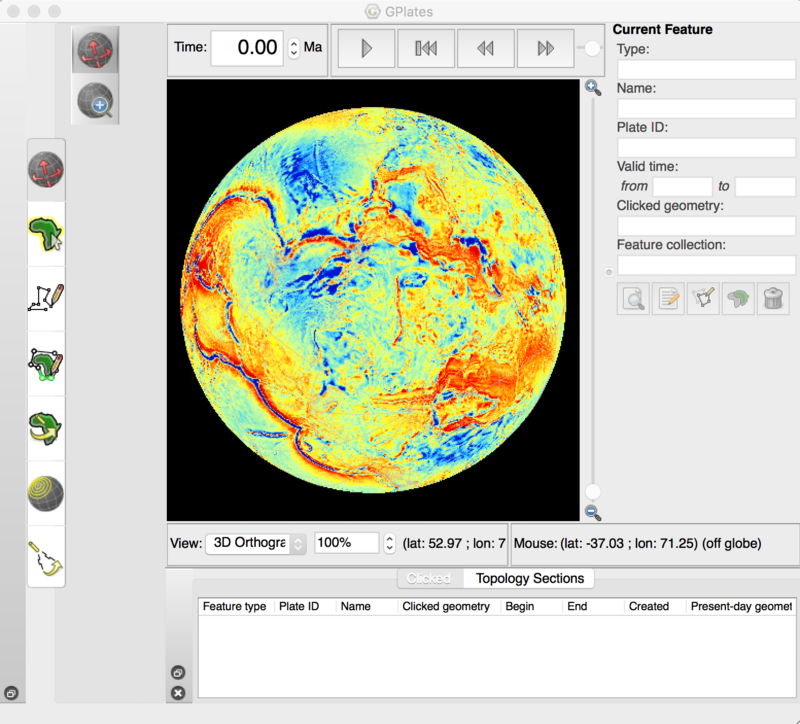 Data by the EarthByte Group is licensed under a Creative Commons Attribution 3.0 Unported License. Please cite the references listed on this page when using GPlates 2.1 data sets. Below is a list of GPlates-compatible data files that can be loaded seamlessly in GPlates. 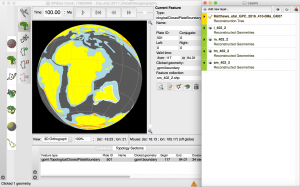 The feature data are available as .gpml (GPlates Markup Language), .dat (PLATES4), .shp (ESRI Shapefile) and .xy (lon, lat with header record) formats. Included in the GPlates sample data are six Generic Mapping Tools (GMT) compatible colour palettes that can be used in GPlates. These included seafloor age, feature age, isochrons and ridges and plate ID – categorical and regular. GPlates 2.1 is packaged with a range of sample data sets that allow users to quickly and easily get up-and-running with plate tectonic reconstructions. The below information details the sources of these data and relevant citations. Data by the EarthByte Group is licensed under a Creative Commons Attribution 3.0 Unported License. When using GPlates and the sample data to make figures for publications, we recommend citing the original data sources as indicated below. The sample data includes the Matthews et al. 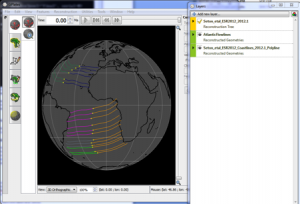 (2016) rotation file, which contains a compilation of reconstruction poles that describe the motions of the continents and oceans. These rotations are a synthesis of many previous studies; each line in the rotation file lists the original source of the corresponding pole of rotation. Many of these original sources are listed within the Matthews et al. (2016) paper listed below. The feature data provided (detailed below) are compatible with this rotation file. Matthews, K. J., Maloney, K. T., Zahirovic, S., Williams, S. E., Seton, M., and Müller, R. D., 2016, Global plate boundary evolution and kinematics since the late Paleozoic: Global and Planetary Change, DOI: 10.1016/j.gloplacha.2016.10.002. 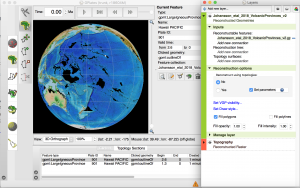 The coastline for Greenland uses the Danish Geological Survey dataset, and the rest of the world uses the World Vector Shoreline from the the Global Self-consistent Hierarchical High-resolution Geography (GSHHG) dataset, Version 2.3.7. The coastline data included here is a simplified version of the “high” resolution GSHHG coastline data – simplified in ArcGIS with simplification tolerance 0.05 decimal degrees (min area: 100 sq km). The coastlines are cookie-cut first using the static polygons, with a second stage applied where oceanic volcanic provinces (Johansson et al., 2018) are used to assign ages to oceanic islands related to hotspots. For more information on GSHHG click here. Bohlander, J. and Scambos, T. 2007. Antarctic coastlines and grounding line derived from MODIS Mosaic of Antarctica (MOA), Boulder, Colorado USA: National Snow and Ice Data Center. Gorny, A. J. 1977. World Data Bank II General User GuideRep. PB 271869, 10pp, Central Intelligence Agency, Washington, DC. Soluri, E. A., and Woodson, V. A. 1990. World Vector Shoreline, Int. Hydrograph. Rev., LXVII(1), 27-35. Wessel, P., and Smith, W. H. F. 1996. 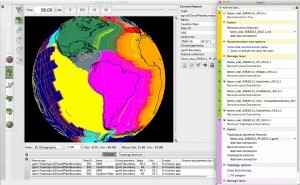 A global, self-consistent, hierarchical, high-resolution shoreline database, J. Geophysical Res., 101(B4), 8741-8743. The continental polygons are a set of data containing the continental lithosphere only (consistent with the static polygons described below). These are consistent with Matthews et al. (2016). The present day Global Continent-Ocean Boundary (COB) Dataset from Müller et al. (2016) are represented as lines along passive margins and do not include active margins. The timescale used is Gee and Kent (2007). The COBs are consistent with Matthews et al. (2016). Müller, R.D., Seton, M., Zahirovic, S., Williams, S.E., Matthews, K.J., Wright, N.M., Shephard, G.E., Maloney, K.T., Barnett-Moore, N., Hosseinpour, M., Bower, D.J. & Cannon, J. 2016. Ocean Basin Evolution and Global-Scale Plate Reorganization Events Since Pangea Breakup, Annual Review of Earth and Planetary Sciences, vol. 44, pp. 107 . DOI: 10.1146/annurev-earth-060115-012211. A topological network of plate polygons with dynamic geometries are provided for the last 410 Ma. These data are provided in gpml (GPlates native) format and so require GPlates to be effectively visualised. Further information of this collection of data can be found here. The Dynamic polygons are consistent with Matthews et al. (2016). This directory contains examples of plate motion “flowlines” across the Atlantic Ocean that have been generated in GPlates. 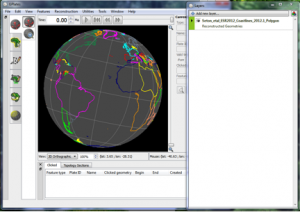 The directory contains a .gpml file which contains seed points at several locations along the Mid-Atlantic Ridge. When loaded with a rotation file the flowlines will be drawn to reflect the relative motion between the plate pair either side of the mid ocean ridge. The flowlines will be reconstructed according to the rotation file that is loaded when they are opened but were created using a ridge axis location that is consistent with Matthews et al. (2016). The grid marks included in the Sample Data have been cookie-cut using the Matthews et al. (2016) model. The hotspot/plume locations are represented as points and are split in Pacific and Indo/Atlantic domains. Locations were compiled from Montelli et al. (2004), Courtillot et al. (2003), Steinberger et al. (2000) and Anderson and Schramm (2005). Plumes closer than 500 km were combined into an averaged location. Whittaker, J. M., Williams, S. E., Masterton, S. M., Afonso, J. C., Seton, M., Landgrebe, T.C., Coffin, M.F., Müller, R.D. 2013. Interactions among plumes, mantle circulation and mid-ocean ridges, AGU Fall Meeting Abstracts. This directory contains the Müller et al. (2016) Ocean Floor Isochron Dataset. The isochrons are represented as lines and do not include reconstructed isochrons. The timescale used is Gee and Kent (2007). They are consistent with Matthews et al. (2016). 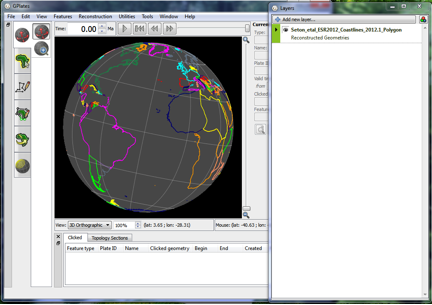 The paleomagnetism data sets are from the IAGA Global Paleomagnetic Database. 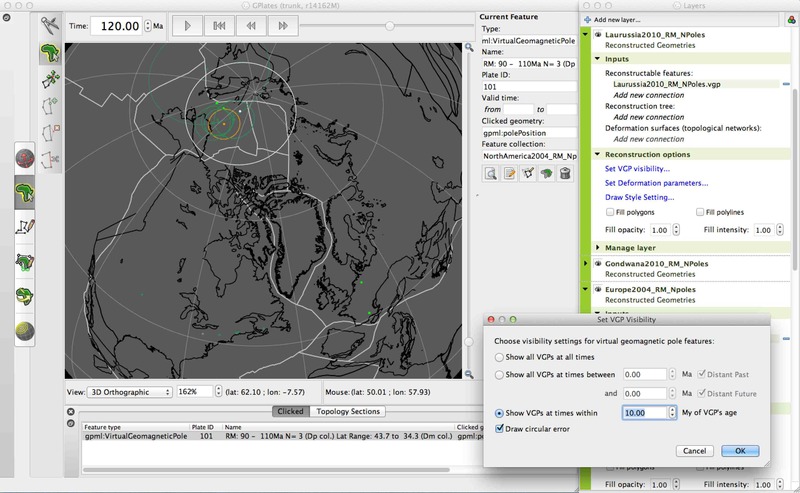 The data are provided in GMAP VGP format, and GPML format. Both file formats can be read by GPlates. Torsvik, T.H., Müller, R.D., Van der Voo, R., Steinberger, B. and Gaina, C., 2008. Global Plate Motion Frames: Toward a unified model. Reviews of Geophysics, 46, RG3004, doi:10.1029/2007RG000227. 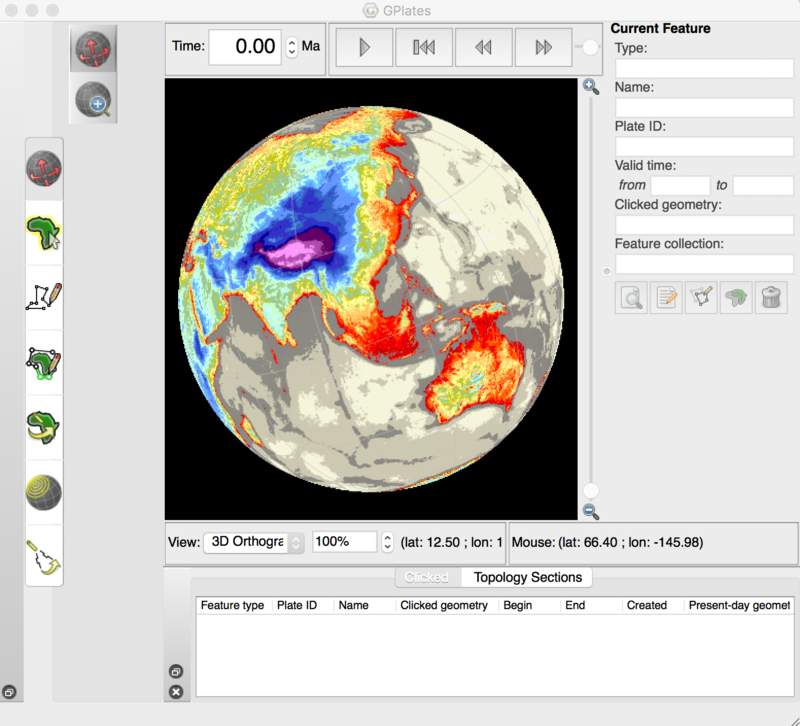 The ‘SeafloorFabric’ folder within the sample data contains a set of geometries that define the tectonic fabric of the world’s oceans. The data are taken from a global community data set of fracture zones (FZs), discordant zones, propagating ridges, V-shaped structures and extinct ridges, digitized from vertical gravity gradient (VGG) maps. More information on the tectonic fabric of the ocean basins can be found here. Matthews, K. J., Müller, R. D., Wessel, P., Whittaker, J. M. 2011. The tectonic fabric of the ocean basins, The Journal of Geophysical Research. Doi: 10.1029/2011JB008413. The Matthews et al. (2016) spreading ridge dataset includes present day spreading ridges and extinct ridges, which are represented as lines. The timescale used is Gee and Kent (2007). 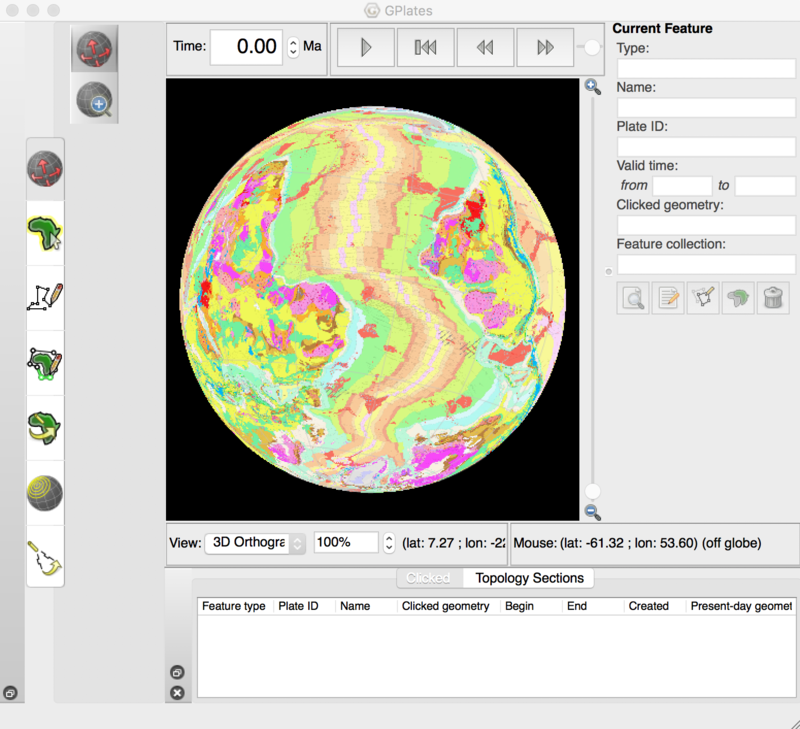 Static polygons allow plate IDs to be assigned to other sets of data and to reconstruct raster data. These polygons, and the set of isochrons defining the age of the ocean floor. Large Igneous Provinces represent spatially-extensive age-progressive plume volcanic products. Whittaker, J., Afonso, J., Masterton, S., Müller, R., Wessel, P., Williams, S., and Seton, M., 2015, Long-term interaction between mid-ocean ridges and mantle plumes: Nature Geoscience, v. 8, no. 6, p. 479-483, doi: 10.1038/ngeo2437. Volcanic Provinces represent a combination of spatially-extensive age-progressive plume volcanic products and other volcanic features. Johansson, L., Zahirovic, S., and Müller, R. D., 2018, The interplay between the eruption and weathering of Large Igneous Provinces and the deep-time carbon cycle: Geophysical Research Letters, doi:10.1029/2017GL076691. 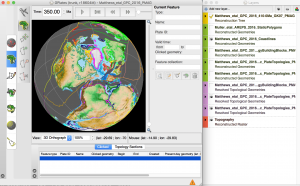 Global paleogeography from the Devonian to present is composed of a series of polygon layers that represent shallow marine, mountaineous, icesheet, and emergent land. Cao, W., Zahirovic, S., Flament, N., Williams, S., Golonka, J., and Müller, R. D., 2017, Improving global paleogeography since the late Paleozoic using paleobiology: Biogeosciences, v. 14, no. 23, p. 5425-5439, DOI:10.5194/bg-14-5425-2017. 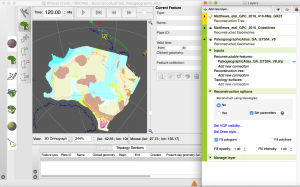 Regional paleogeography of Australia for the Phanerozoic is adapted from the Australian Paleogeographic Atlas, and represents a range of paleo-environments. Totterdell, J.M., Cook, P.J., Bradshaw, M.T., Wilford, G.E., Yeates, A.N., Yeung, M., Truswell, E.M., Brakel, A.T., Isem, A.R., Olissoff, S., Strusz, D.L., Langford, R.P., Walley, A.M., Mulholland, S.M., Beynon, R.M., 2001, Palaeogeographic Atlas of Australia: Geoscience Australia. This a variant of the Matthews et al. 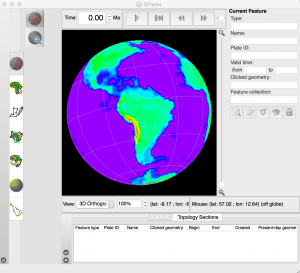 (2016) topological plate polygon and plate boundary dataset where the absolute reference frame for the continents has been changed to be entirely paleomagnetic. Torsvik, T. H., Van der Voo, R., Preeden, U., Mac Niocaill, C., Steinberger, B., Doubrovine, P. V., van Hinsbergen, D. J., Domeier, M., Gaina, C., and Tohver, E., 2012, Phanerozoic polar wander, palaeogeography and dynamics: Earth-Science Reviews, v. 114, no. 3, p. 325-368, DOI: 10.1016/j.earscirev.2012.06.007. Domeier, M., and Torsvik, T. H., 2014, Plate tectonics in the late Paleozoic: Geoscience Frontiers, v. 5, no. 3, p. 303-350, DOI: 10.1016/j.gsf.2014.01.002. 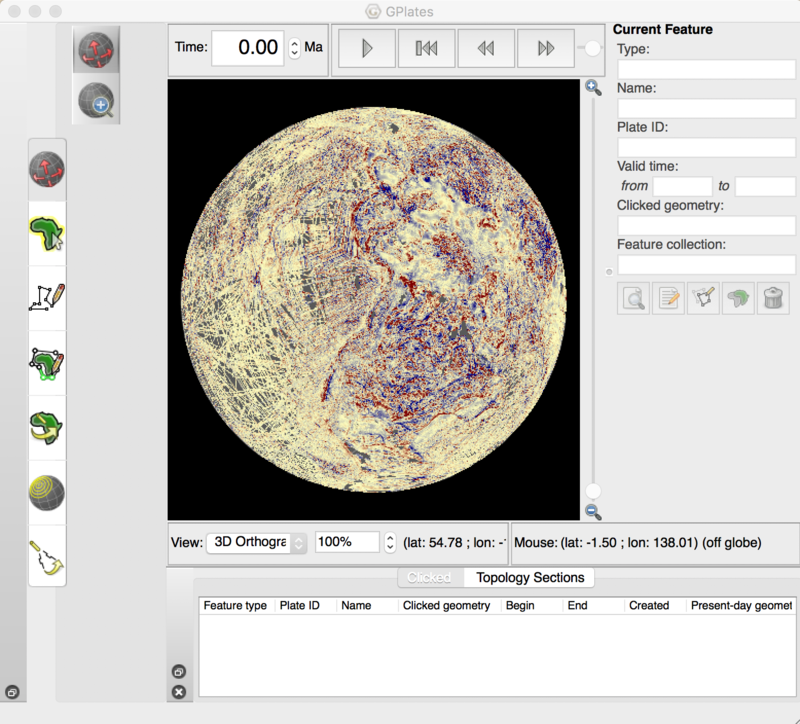 Note: the resolution of the provided rasters has been limited to reduce the file size of the GPlates package. The original data sets are available in higher resolutions from links provided. Each raster has at least two associated files, a .jpg/.png/.tif image file AND also a GPlates .gpml file. For easiest results, open the .gpml file in GPlates. GPlates will then generate some cache files that help it display the raster. Generating the cache files takes up some hard drive space and can take a minute to generate them the first time the rasters are loaded. 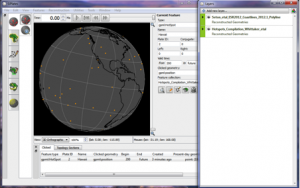 Each subsequent loading of the raster using the .gpml file will be quicker, as GPlates will use the already-generated cache files. The Seafloor_Age_Grid contains a third .gproj file which is the best one to load this raster. Also contained in each of these folders is a Legend image which gives an indication what the colours refer to. Note: When importing your own raster, GPlates will automatically generate a GPML file. 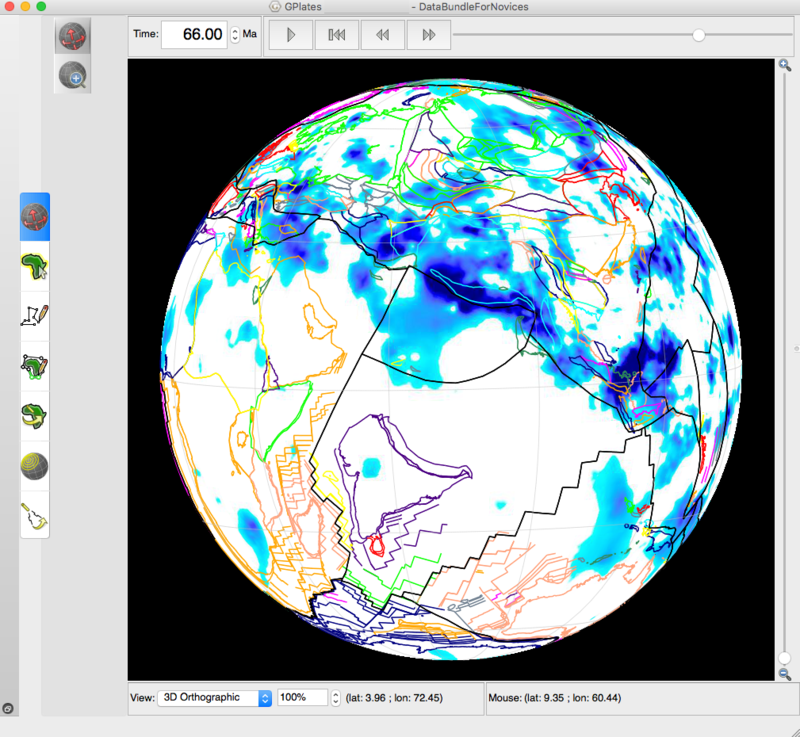 To save time, next time you can just load the GPML file, and thus skip the import raster step. When loading rasters for the first time, GPlates may take a few minutes to generate the cache files that will enable efficient viewing. These only need to be generated once, however, if they are deleted, they will be re-generated. In order to reconstruct these features, you will need to load in the underlying rotation model (.rot file) cookie-cut the data using the Static Polygon files, which can be downloaded above. NetCDF numerical grid of seafloor age consistent with the Muller et al. (2016) produced by the EarthByte group with 6 arc minute resolution. It is best to open the Project (.gproj), as this will import the correct colour palette settings. As this is a grid file (.grd) no legend is required, however, this is accessible from the GPlates Layers dialog. A higher-resolution 2 arc minute grid is available from here. 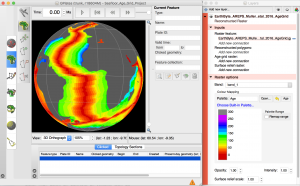 Colour grid of present-day 1 arc minute resolution topography (ETOPO1) from Amante et al. (2009), with white regions representing ice sheets. This is available from the National Geophysical Data Center (NGDC). More information, and the original data in a variety of grid formats, can be found here. Amante, C. and Eakins, B. W. 2009. 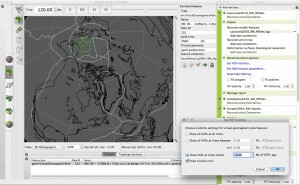 ETOPO1 1 Arc-Minute Global Relief Model: Procedures, Data Sources and Analysis. NOAA Technical Memorandum NESDIS NGDC-24, 19. The image of free air gravity is generated from Sandwell et al. (2014) and from the Danish National Space Centre (DNSC). In ploar regions, north of 80N and south of 80S the gravity anomalies are from the DNSC08. For latitudes within +/- 80 degrees, the gravity model of Sandwell et al. (2014) is used. More information, as well as the original data sets in their full resolution, can be found here for the DNSC and here for Sandwell et al. (2014). Sandwell, D. T., Müller, R. D., Smith, W. H. F., Gracia, E. and Francis, E. 2014. 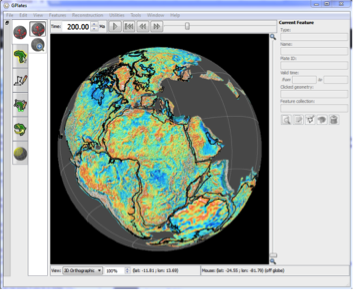 New global marine gravity field model from CryoSat-2 and Jason-1 reveals buried tectonic structure. Science, Vol. 346 (6205), pp. 65-67. Doi: 10.1126/science.1258213. Andersen, O. B., Knudsen, P. and Berry, P. 2010. The DNSC08GRA global marine gravity field from double retracked satellite altimetry, Journal of Geodesy, Volume 84, Number 3. DOI: 10.1007/s00190-009-0355-9. Andersen, O. B., 2010. The DTU10 Gravity field and Mean sea surface. Second international symposium of the gravity field of the Earth (IGFS2), Fairbanks, Alaska. The Vertical Gravity Gradient (VGG) grid is from Sandwell et al. (2014). More information, as well as the original data sets in their full resolution, can be found here for the DNSC and here for Sandwell et al. (2014). Bouguer gravity anomalies from the World Gravity Map (Balmino et al., 2012). Balmino, G., Vales, N., Bonvalot, S. and Briais, A., 2012. Spherical harmonic modeling to ultra-high degree of Bouguer and isostatic anomalies. Journal of Geodesy. July 2012, Volume 86, Issue 7, pp 499-520 , DOI 10.1007/s00190-011-0533-4. Isostatic gravity anomalies from the World Gravity Map (Balmino et al., 2012). Colour grid of magnetic anomalies from EMAG2 (Maus et al., 2009). 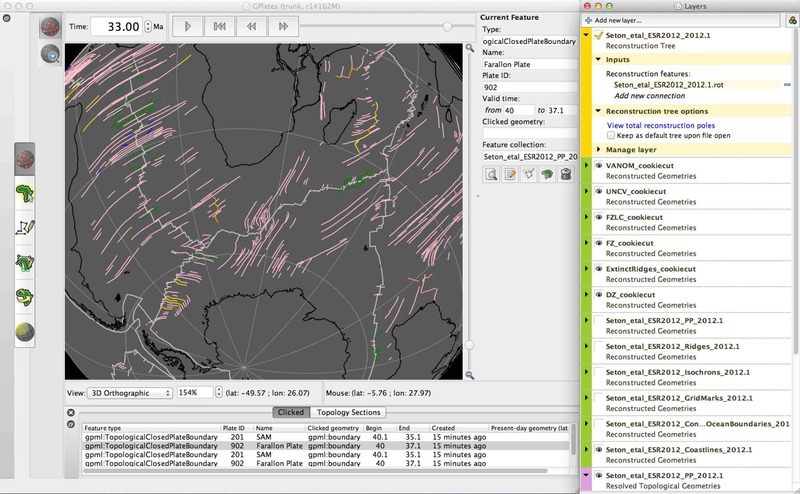 This raster does not use the directional gridding to fill gaps, and so better represents the raw magnetic data. More information, and the original data at full resolution, can be found here. Maus, S., Barckhausen, U., Berkenbosch, H., Bournas, N., Brozena, J., Childers, V., Dostaler, F., Fairhead, J., Finn, C., and von Frese, R., 2009, EMAG2: A 2-arc min resolution Earth Magnetic Anomaly Grid compiled from satellite, airborne, and marine magnetic measurements: Geochemistry, Geophysics, Geosystems, v. 10, no. 8, p. Q08005, doi:10.1029/2009GC002471. World geological map from Bouysse (2014) published by the UNESCO CGMW program. Bouysse, P., 2014, Geological Map of the World at 1:35 000 000. Crustal thickness model (CRUST 2.0) from Laske et al. (2000). Laske, G., Masters, G., and Reif, C., 2000, CRUST 2.0: A new global crustal model at 2×2 degrees, Institute of Geophysics and Planetary Physics, The University of California, San Diego, website: http://igppweb.ucsd.edu/~gabi/crust2.html. Second invariant of strain rate from Kreemer et al. (2003). Kreemer, C., Holt, W. E., and Haines, A. J., 2003, An integrated global model of present-day plate motions and plate boundary deformation: Geophysical Journal International, v. 154, no. 1, p. 8-34, doi:10.1046/j.1365-246X.2003.01917. GPlates also has the ability to display time-dependent rasters. These rasters can e global or regional, and the suffix to the filename is a dash or underscore followed by an integer age in millions of years before present. In the Sample Data we include a time-dependent raster of slabs age-coded from the MIT-P P-wave seismic tomography (Li et al., 2008), where slabs are assumed (on the first order) to sink vertically with a constant sinking rate. The sinking rate applied here is 3 cm/yr in the upper mantle, and 1.2 cm/yr in the lower mantle. 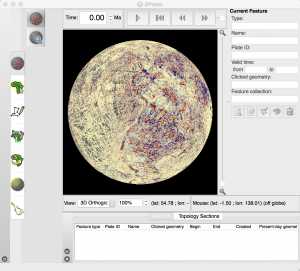 The quickest way to visualise this dataset in GPlates is to load the. gpml file (MIT-P08-Asia-UM30 LM12.gpml) as described above.However, the first time the time-dependent rasters are loaded, GPlates will need to generate cache files for eachdepth/time layer. This process will take some minutes, and will take up a total of about 350 Mb of hard disk space. GPlates requires that the rasters follow the same file naming format, and that they are all exactly the same dimensions (pixel width and height). Li, C., van der Hilst, R., Engdahl, E. and Burdick, S., 2008. A new global model for P wave speed variations in Earth’s mantle. Geochemistry, Geophysics, Geosystems, 9(5): 21, doi: 10.1029/2007GC001806. Note: You will only need to load the GPML the next time you need to use the time-dependent raster, which allows you to bypass the re-import process.